City Beat News congratulates those companies that demonstrate excellent customer service. Marielaina Perrone DDS, has won the Spectrum Award of Excellence and is most honored to have earned such high ratings for such a prestigious award. 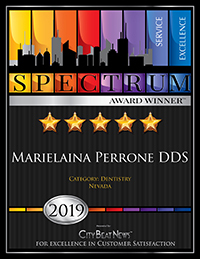 Marielaina Perrone DDS in Henderson, NV has won the 2019 Spectrum Award for excellence in customer service and earned a rating of 5 out of 5 stars. This coveted service award was presented to Marielaina Perrone DDS by City Beat News.